Disposable coffee cups are causing a huge strain on the environment meaning that your daily brew comes with a high environmental price. Single-use coffee cups are already being phased out by coffee shops, cafes and any business looking to cut waste. Consumers are now moving towards eco-friendly reusable coffee cups so that they can enjoy their daily coffee guilt-free! 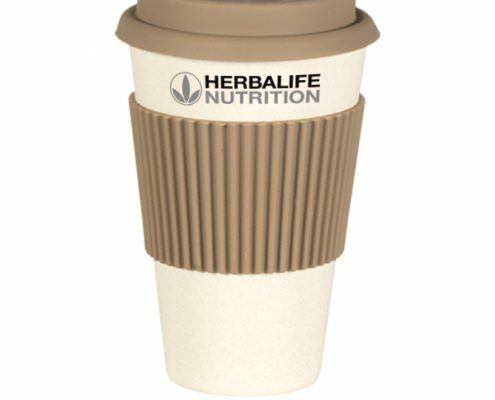 Create an eco-friendly reusable cup for your business and it will be seen each time the recipient has a coffee on the go. Spread your brand name far and wide. This Bamboo Reusable Coffee Cup is made from bamboo and corn fibre which is a natural renewable resource. These natural fibres also give our reusable Bamboo cups an eco-friendly appearance and a natural look. As these high quality takeaway coffee cups are made from natural materials they won’t cause any plastic pollution. They’re perfect for any brand looking to create a lasting impression and to show that they care about sustainability and reducing waste. Our Bamboo Reusable Coffee Cup holds 430ml. Both the sleeve and lid are made from silicone and can be easily removed. The silicone can be created in any colour to suit your brand. We can provide cups in a range of colours to suit your business branding. These are a premium product. 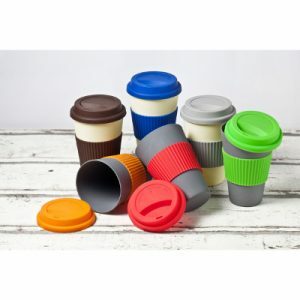 For a more economical choice view our Reusable Coffee Cups made from plastic. Ideal for coffee shops and cafes looking to provide an eco-friendly alternative to single-use coffee cups. Can be sold in-store or given away to loyal customers. 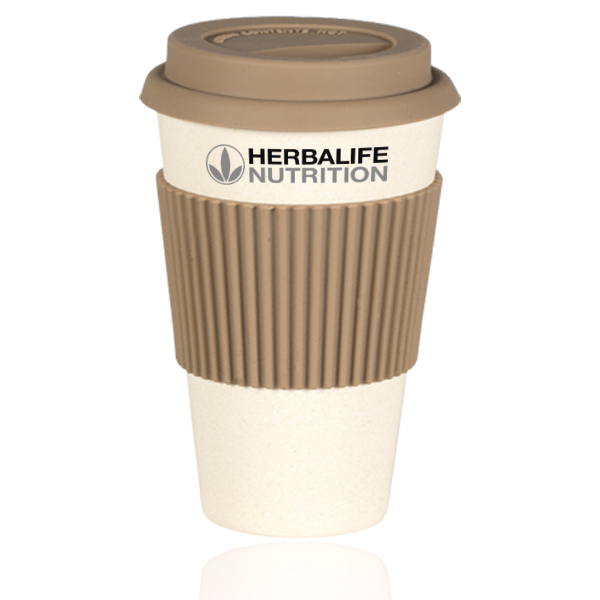 Great for events using a mobile barista – clients and customers will leave with your branded reusable coffee cup and be reminded of your business every time they reuse it. Choose from wrap-around print or pad printing on the front of your bamboo coffee cup. You can also select any colour for the silicone lid and sleeve. Branding Options: Screen Print (1 colour). Pad Print (up to 5 colours).